More than 70 social workers and educators attended “Supporting Veterans’ Children through Transitions,” the first workshop of the newly formed Social Work Continuing Education program June 2. TUSCALOOSA, Ala. – The University of Alabama is now a hub for social work licensure preparation and continuing education. The UA School of Social Work has partnered with the UA College of Continuing Studies to establish a continuing education program that will offer annual and biannual prep courses for required areas of the licensure test and provide continuing education units for topics like psychopharmacology and supervision and ethics at monthly workshops held on campus. Although the school has endorsed continuing education events in the past, the new program will allow the school to choose and develop its own workshops based on the needs of alumni and social workers across the state, and emerging areas of focus in the field. Social workers must have their licenses renewed once every two years and must accumulate at least 30 contact hours in that span. Each hour of participation at workshops, conferences and professional development is equal to one CEU. The monthly courses and workshops are open to anyone “who wants to continue learning,” Welker said. Amanda Bergeron, program manager for CCS, said the scope of Social Work’s continuing education program is the largest of its kind that has been implemented through CCS, which is helping to develop marketing materials and manage logistics for events. Bergeron said she anticipates hosting at least six events through the rest of the year and 12 in each calendar year. 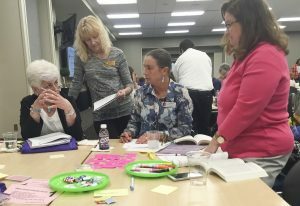 The program began June 2 with “Supporting Veterans’ Children through Transitions,” a daylong workshop that enabled youth-serving educators, professionals and parents to support the transitional issues children face when their parents separate from the military. The course also addressed the challenges of children whose parents have died or experienced combat-related injures or illnesses. UA partnered with the Military Child Education Coalition, which conducts 20-30 workshops across the country each month. June 2 marked the group’s second workshop in Tuscaloosa this year. For more information about the continuing education program, visit https://socialwork.ua.edu/continuing-education/.